A ‘mamekobachi’ bee which is a little smaller than honeybee is widely utilized for insect pollination mainly in the Tohoku Region. Centering on Aomori Prefecture, a fruit farmer in the Tohoku Region makes use of a small bee called ‘mamekobachi’ for an apple or a cherry fruition. This way of pollination was invented after the end of the Second World War and now is prevailing across the country. 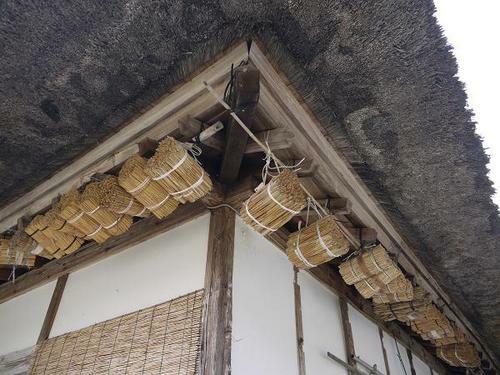 Many bundles of straw dangling under the eaves in the picture are nests of the bee seen in ‘Ouchijuku’ near ‘Aizu-Wakamatsu’, Fukusima Prefecture. This kind of bee originally oviposits in dried reeds used for the thatched roof. Accordingly farmers figure out this device with an uneven cut end for bees. The ragged cut end is intended that each reed can be identified by the bee with a corresponding insect house. These bundles are moved to a nearby orchard before spring comes in that many new adults come out of each reed to collect fresh pollen.